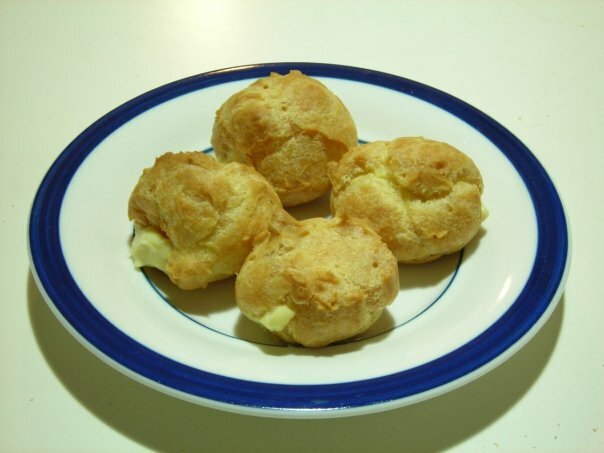 Profiteroles/cream puffs are the perfect finger food for any parties or any functions as they are simple to make, use simple ingredients (doesn’t require anything fancy) but taste amazingly delicious. I love making these crowd-pleaser dessert whenever I have pot luck or gathering with my friends. The addition of lemon zest into the cream mixture exudes nice zingy lemon aromas that fill your mouth. 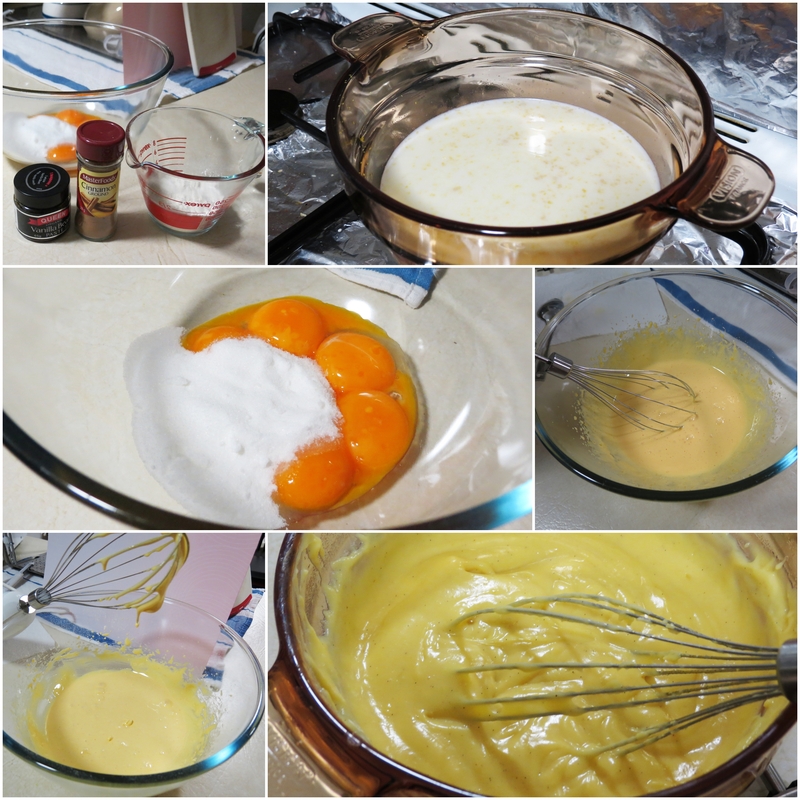 It is crucial to cook the cream filling mixture until the right consistency is achieved. You can test the mixture consistency by lifting up the whisk over the bowl and the cream should flow down in a continuous ribbon fashion. Mixture that is too runny will make the puffs soggy and if it’s too thick, it’s difficult to pipe into the puffs and. it is also important to take note of the heat when cooking your cream mixture. 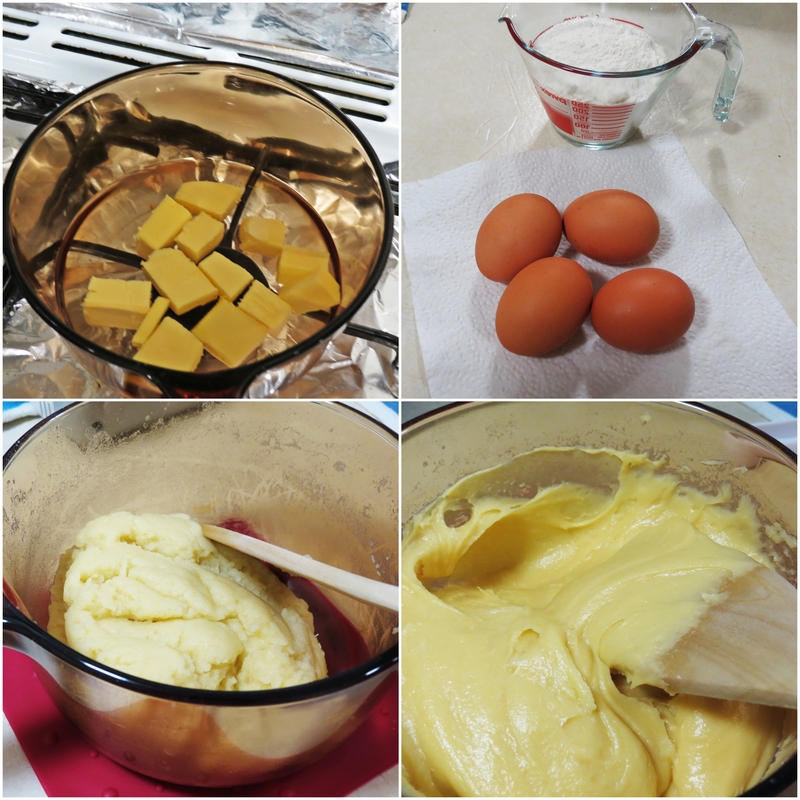 To obtain silky smooth cream and to avoid curdle, always cook the pastry cream over low heat and stir constantly. In a saucepan, bring the milk to a boil with 1/4 cup of sugar and lemon zest. Whisk the egg yolks in a bowl with the salt and remaining sugar. Sift the flour over the egg mixture and whisk it in until smooth. When the milk boils, slowly whisk one-third of it into the egg mixture. Then slowly add the egg mixture to the milk in the saucepan. Note: You must follow these steps to gradually raise the temperature of the eggs. If you add them all at once to the hot milk they will curdle. Return the saucepan to a medium heat and again bring to a boil, whisking continually. The mixture should begin to thicken. Allow it to boil for another minute. Remove from heat and whisk in the vanilla and cinnamon. Transfer the pastry cream to a bowl. Press plastic wrap against the surface. Refrigerate until very cold, about 2 hours. In a medium saucepan, combine water, butter and salt. Bring to a boil. With a wooden spoon, beat in flour all at once. Continue beating until mixture forms a ball and leaves side of pan. Beat in eggs, one at a time, beating hard after each addition until smooth. Continue beating until dough is satiny and breaks in strands. Line baking tray with baking paper. Using a pair of teaspoon, drop the dough onto the baking sheet. Bake until puffed and golden (40-45 minutes for large) (25-30 minutes for small). Puffs should sound hollow when lightly tapped. Let cool completely on wire rack. Make a hole on the puffs using a chopstick. Fill pastry bag with the lemon cream and pipe the cream into the puffs.